Kim Hyun Ji (Kim So Hyun) studied for her 19 years before she died in an accident. She is now a ghost and has wandered around the world for several years. Hyun Ji then meets exorcist Park Bong Pal (TaecYeon). Hyun Ji and Bong Pal listens to various stories from ghosts and sends them to the otherworld. im glad to see him on screen again. Wow! I like both Kim So Hyun & 2PM Taecyeon Oppa!! I cant wait to watch this drama. fighting! i’ll wait this drama. i love you kim so hyun…. I’m really rooting for u..I won’t stop being ur fan..and I can’t wait for ur new upcoming drama let’s fight ghost..
but one thing i dont get it is why it’s 11th instead on 4th. Another Oh Hae-young is finished on june 28th. why 1 week gap??????? I’d love to see Kim Soo Hyun in another drama but is she tired? She is just a little girl, she join so many project like she doesn’t have any other hobbies :/ Fighting! The first episode is very good, well done. Eventhough it’s scary, this drama is really funny XDXDXD worth to watch! nice one 4 monday-tuesday drama, worth to watch !! Haven’t watched yet but from the ratings it looks like it’s off to a nice start! very entertaining, especially the supporting casts. This drama like of the combination between “Master Sun” and “Oh My Ghost”. Scary? Yes..Funny? YES…Keep on watching next episode? Oh yeaahhh. Let’s Fight Ghost..hwaiting!! Whoa, So Hyun is grow up now. She is not a kid anymore. She’s beautiful as always even she is a ghost. Hahaha. Like this drama. OMG.. it is so debak .. (I have just watched it till ep4 and actor is taecyeon with kim soo hyun ) love them soo much Ahh.. its so fun and exciting watching it. i loved it. Phallyy (Jul25 n 26) wating for next ep. I think Kim Hyun Ji is not dead, she is in coma. Eventhough this is a production from TVN but it’s not so good as usual, the plots are a bit loose and they give too much air time to the 2 clowns. i think hyun ji is in coma like jyieni 68 said, because her heart still beats and her face doesn pale like the other ghosts. I love this drama so much super hilarious gah!!! Welcome back Teacyeon Oppa!!! I really like all your Dramas.. This is so funny and entertaining.. I also like Kim Soo Hyun, she’s getting prettier and beautiful acting always.. fighting! So Funny And Romantic.. Somehow it has similarity in OH MY GHOST.. but never the less this kdrama is just amazing.. Im enjoying it so far..keep it up.. Greetings from PHILIPPINES..
Agree Mango Shake, can not wait for eps 9!!! U won’t felt boring when you are watching… Very nice.. About human and ghost love story……..
Another ‘the cemistry is so reaaaal’ couple beside Eric and Seo Hyun Jin. Man, kapan gw berenti nonton drama kalo yg tayang bagus bagus mulu. 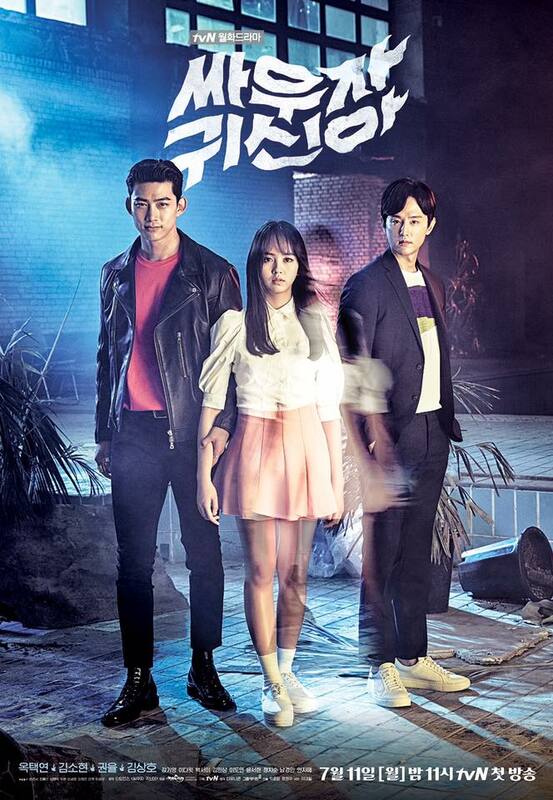 Sorry, I was liking this drama, but the romance between a man and a “ghost” is just a little to weird. To be honest, it’s downright off-putting. It’s like he’s having a very taboo relationship. I’m surprised they are not showing more of the reaction from the people around him. Let’s get real, if you see someone talking, laughing, kissing someone invisible in the streets and people are not taking notice? I don’t think so. He comes across as downright crazy. Nothing like the actress in Master’s Sun. When his uncle came home and caught him, it just made it feel even more weird. I hope they hurry up and find her asleep in a coma. Nice drama..just like master’s sun and oh my ghost. Thumb up. Recommended. it’s a nice ‘ghostbuster’ drama, with a happy ending. worth watching! A little bit scary (for the faint-hearted ones like me) yet fun to watch, highly recommended! I am glad that I didn’t skipped this drama or else I will regret. Nice drama. Love the chemistry between Hyun Ji and Bong Pal. Bong Pal’s 2 college friends are funny too. Although it is scary, it is enjoyable and funny too. I wonder that someone, who was comma for 5 years, can recover in short time, can’t she ? In my opinion, she might struggle to move her hands or legs. But, I notice that in one scene in the hospital room, not long after she conscious, she sit on the bed with crossed legs and cutting paper. It doesn’t mean that I don’t believe miracle. I think the production team should aware about this. So glad to have been able to see LET’S FIGHT GHOST. It was cute how Bong Pal & Hyun Ji were inexperienced at love. Their awkwardness made it funny. The professor was scarier than any of the ghosts. Kwon Yool did a phenomenal job in portraying a monster. CONGRATS to everyone for a job well done. amazingly well written content do check you email..! !